Destin Glass specializes in replacing your old or failed Sliding Glass Patio Doors with high performance energy efficient Hurricane Impact or Non Impact glass. We can also service your French Doors and Single Hung Doors! Is the glass on your patio door broken? Call us today for a free repair estimate! Have you had a break-in or did the lawn mower kick up a rock and break the glass in your patio door? If you can provide an approximate size of the door, we can offer you a free estimate over the phone. We work on both single pane and dual pane patio doors of all sizes and depending on the type and size of the door we can sometimes even replace the glass in the same day. Call us today to get a free estimate or to schedule an appointment. Are your glass patio doors difficult to open? Does it feel like it weighs a ton? You don’t need to replace the patio sliding door, just replace the rollers! When a sliding glass patio door is difficult to open and it is not working properly it can feel like it weighs a ton. Adding to the hassle of trying to close the door, the door can then become a safety hazard and an energy efficiency problem. When these things occur, contact Destin Glass and we will come and replace the rollers on your sliding patio doors. You don’t need to replace the door… just the rollers! Destin Glass also provides track replacement for worn out sliding glass patio doors tracks. 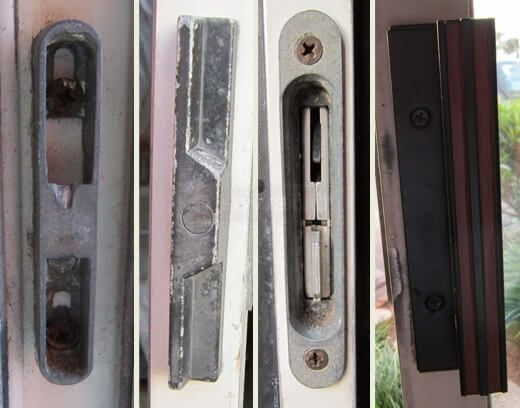 Is the lock on your patio door broken or jammed? Did the handle break off after years of frequent use? We stock many of these replacement parts and specialize in these types of repairs. Call us today to schedule an appointment for repair! Sliding patio doors see a lot of use, and it isn’t uncommon for the lock to occasionally jam or break, requiring repair or replacement. If the lock on your patio door does not work properly, this can create a security risk. We stock many different types of patio door locks and handles that are commonly found within our service area and have the ability to order hundreds more. Call us today to schedule an appointment to fix your patio door lock or handle so that you can sleep well at night knowing that your home is secure.